I’ve been busy with a last minute project so I am a bit late posting this, but better late than never… I am going to participate in the Solingen show this year and here’s a new piece I got ready for the occasion. 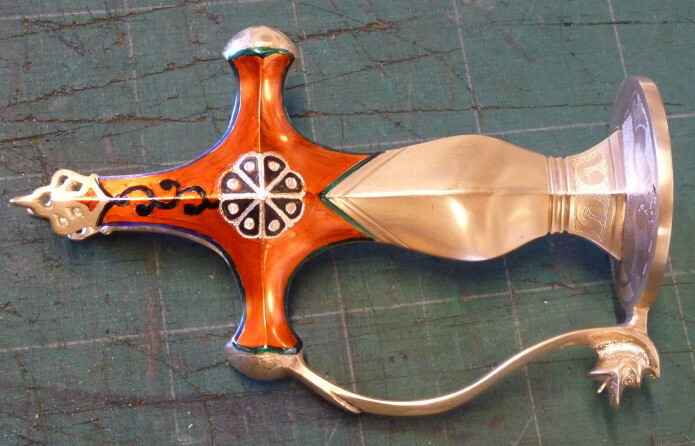 This is another version of the lovely Indian sosun pattah-sword design. The sword is markedly bigger than the previous sword (that is still looking for a home), but the biggest difference is the hilt that is made of cast bronze. Here are the basic stats: oa. 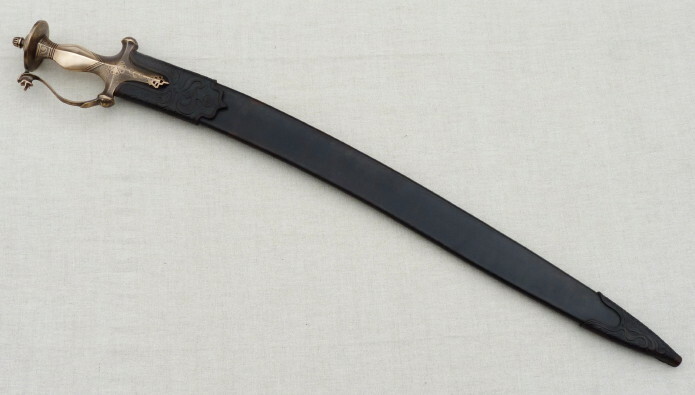 length 85cm, blade length 71,5 max blade width 4,2cm, blade thickness 9mm, weight 1,326kg and point of balance 12,3cm from the guard. The T-ribbed blade is forged of 990-carbon steel and the hilt was cast by my next-door foundryman after the wax model I made. 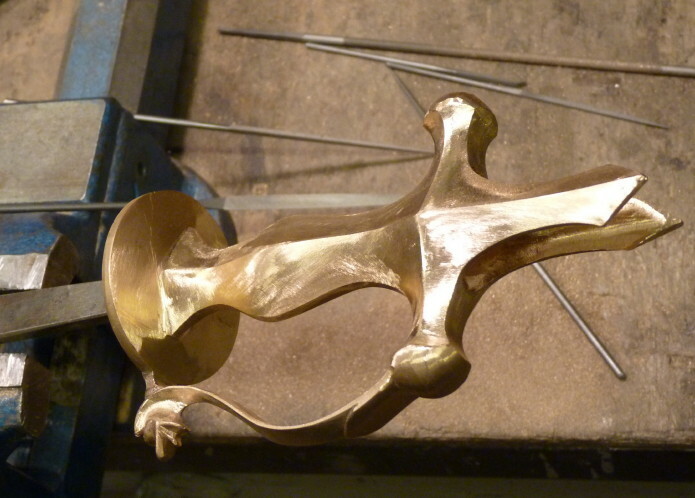 As I knew that the casting process is somewhat primitive I left out all decorative work from the wax. 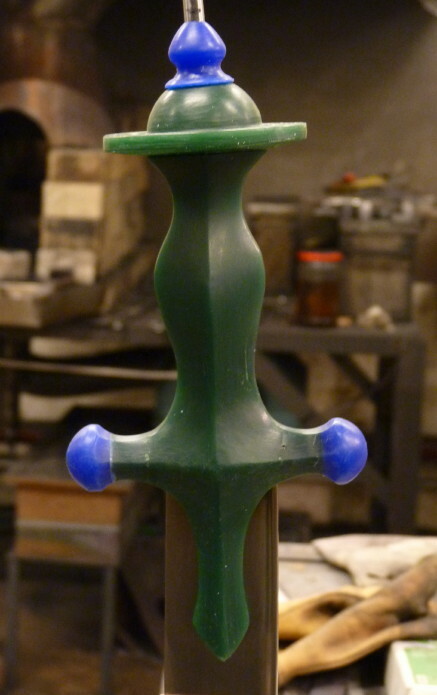 Also, as the weight of the hilt was likely to be excessive it was necessary to be able to work with the lines of the hilt without being hindered by cast-in decorations. The casting process went fairly well - there were only a few disturbing shuts and bubbles. 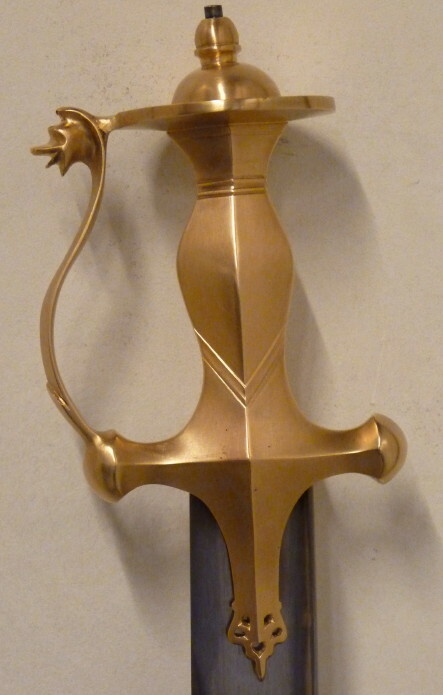 The decorative work technique on the hilt was something that I had done earlier only in a much smaller scale. In my eyes it turned out ok, giving out a slightly rough outlook that just what I was trying to achieve. 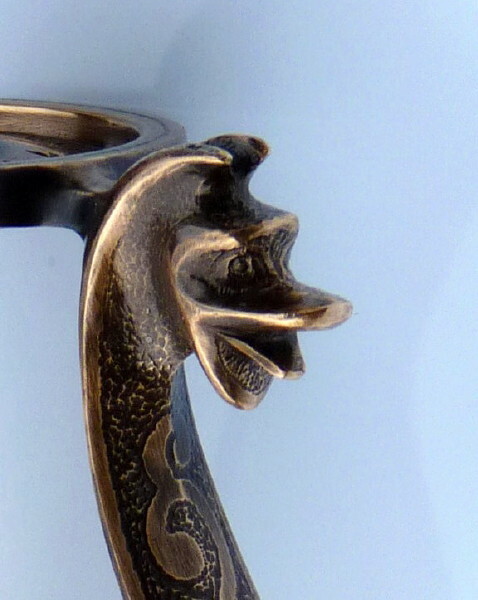 The “makara” on the knuckle-guard is my version of the mythical beast -clearly this one is more closely related to ducks than tigers or lions! The blade is decorated with free-hand etchings to simulate the koftgari-decorations of the originals. 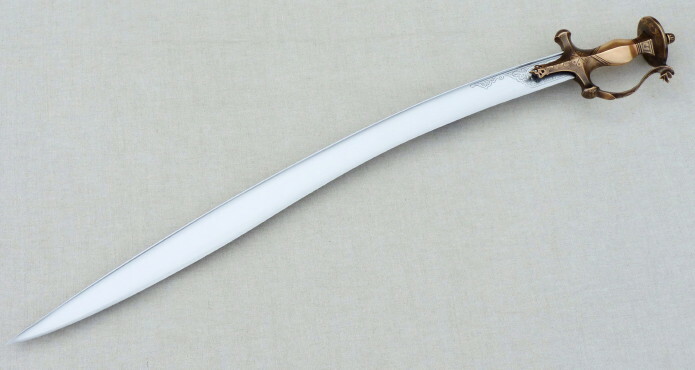 Unlike the originals in which the blade is held in place only by glue, this sword has the tang riveted to the pommel the same way I do with the European-style swords. To complete the piece, there is an all leather scabbard for the sword, with decorated scabbard mouth and chape of the same material. Stunning work JT, thanks for sharing. 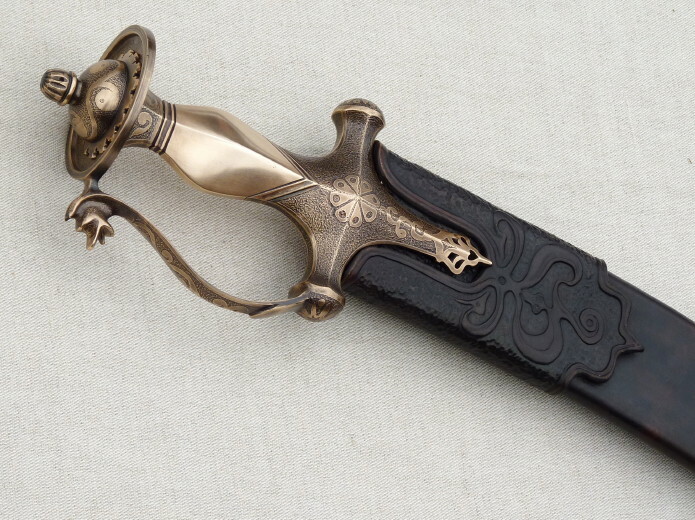 I'm not normally a fan of Eastern style weapons, but this is stunning. Absolutely breathtaking finished product.... I'd be proud to own this blade. Absolutely wonderful piece of art! I don't know what more could be said. 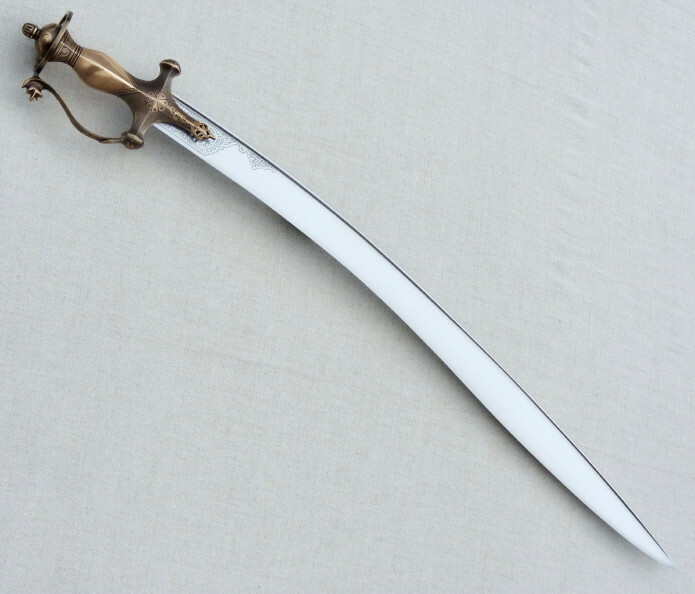 -And I will get to see this sword this coming weekend. ...and that blade looks like it's perfectly-capable of taking off some heads! 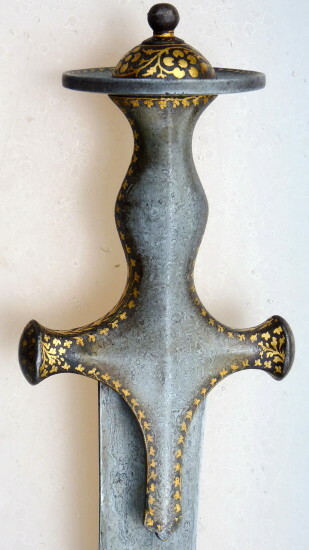 Out of curiosity, would that hilt also work on a Tulwar sabre? It looks similar in some ways. I know that Indian-style weapons are not everybodys’ cup of tea, so it is very rewarding to see that folks here at the forum appreciate this kind of stuff as well. Peter, it’s going to be fun at Solingen, we’ll be poking each others’ swords and sticking fingerprints on them! Can’t wait! I’ll be lugging four swords to Solingen: Two sosun pattahs, the JTMEFECIT-inscribed X-type and a custom order wheel-pommeled single-hander that I just got ready twelve minutes ago, plus two or three knives. I personally love the eastern styles and this is a fine interpretation. 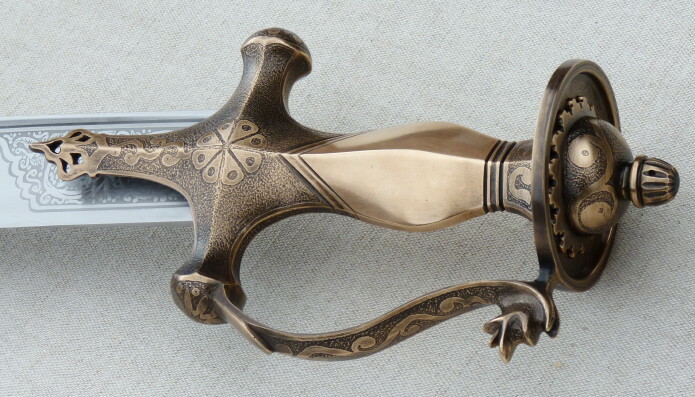 This is a terrific level of detail you have achieved on this hilt and the blade. 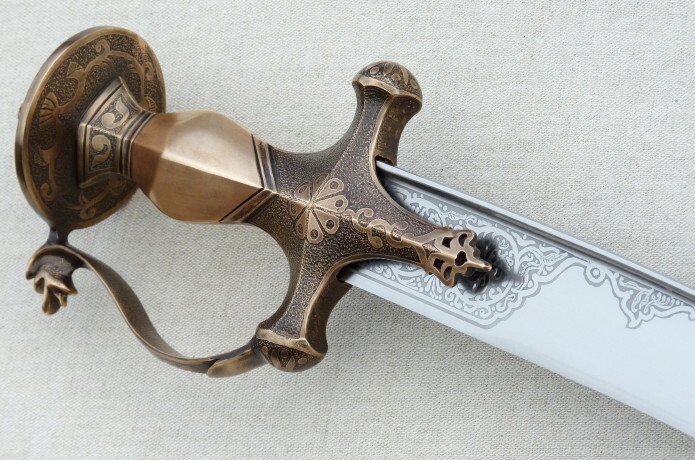 Is the motif on the blade engraved or etched? very well designed and executed. I would love to attend the Solingen event one year, have fun! Thanks Joshua, I think Peter Johnsson also commented something about the amount of details crammed in the sword. 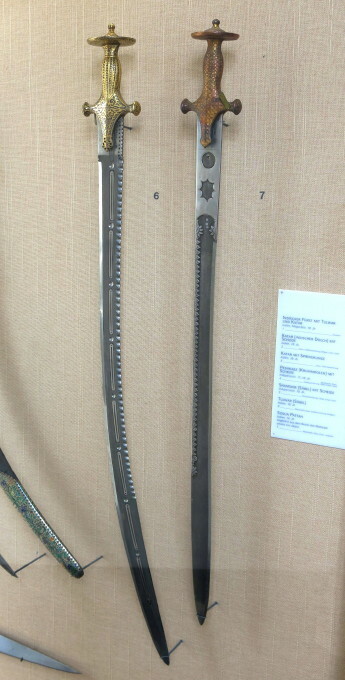 So on the show weekend there were three sosun pattahs’ in the Klingenmuseum premises as I discovered one such in the displays - albeit the blade of the sword is one of the weirdest I have come across so far. The Klingenmuseum sosun pattah on the right, the blade actually has holes in it...! I did not understand the size of that sword before the photo on the table with you as reference. It's a beauty and a beast. Thank you Keith, this one is actually bit on the big side as sosun pattahs’ go, usually the blade length is 66 cms or thereabouts. -And when I Finally get some tatami-mats I am so going to do test-cutting with these swords! –Maybe even do a little video of it…! wonderful humbling work! I love the casting and detail work..
Just realised why I'm not fond of this area of swords. i see too many cheaply made bits of tourist rubbish for only a few pounds in junk shops. This has made me look anew, what a stunning bit of work. You've done an entire area of cultural heritage justice, wonderful. The amount of detail and contrasting textures and colours are really fantastic as well as the sword as a whole. 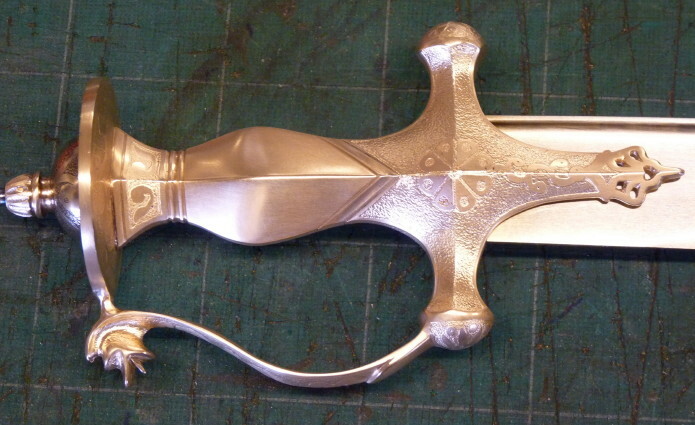 I know examples of pulwar have a pin present in addition to the resin that holds the blades in the hilt. 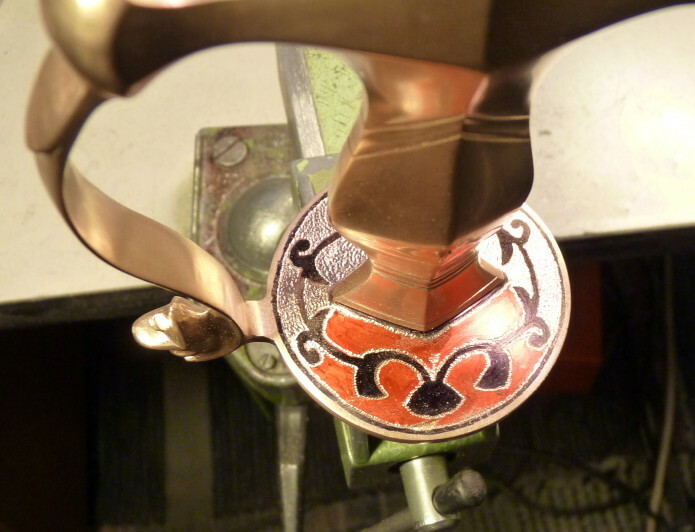 These pins would often be located in the center of the rosette decoration on the quillon block extending through to the other side and riveted in place. Just because pulwar are related to talwar, I'd be curious if other examples of Sosun Pattah also exhibited this trait. Scott: That hilt decoration work humbled ME! The crouched working position with the flexi-drill cramped my back so badly that a masseuse was needed to get my back muscles moving again! 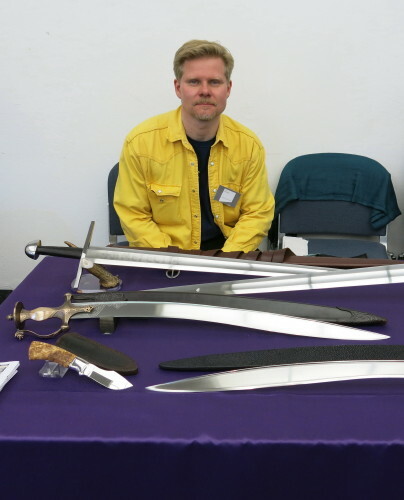 Mark: Yes, I know what you mean, those cheapos make me go “Brrrr!” whenever I see them… There are some good quality local-made present day swords about, but they are a bit rare – and so far there have been no modern sosun pattah reproductions that I have come across. Right, found the pictures I was looking for. 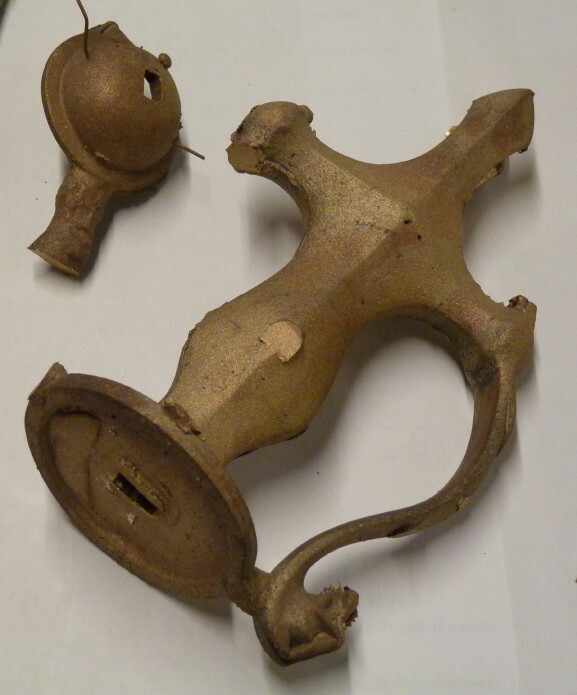 In the first picture the pin goes through the hilt of a tulwar at the waist (or neck?) just below the disk pommel. The second picture I remembered wrong, the hilt on the right has the pin just in the center of the guard, but the blade is of a tulwar-type. 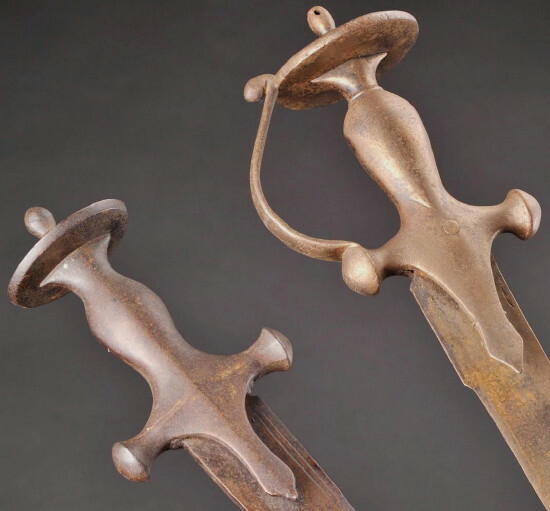 The left-hand sword has a very shallowly curving blade that might be a sosun pattah or an undecorated kirach. When I get a chance to do some test-cutting with this sword, I‘ll be posting the results in this thread.